The sibling of the Flushing-based Mad For Chicken operation opened this past weekend at 58 Avenue B at East Fourth Street. There's also a Turntable location on Fifth Avenue in Koreatown. Their description: "Korean eatery & bar serving fried chicken, soju & cocktails in a hip setting with jazz-themed decor." 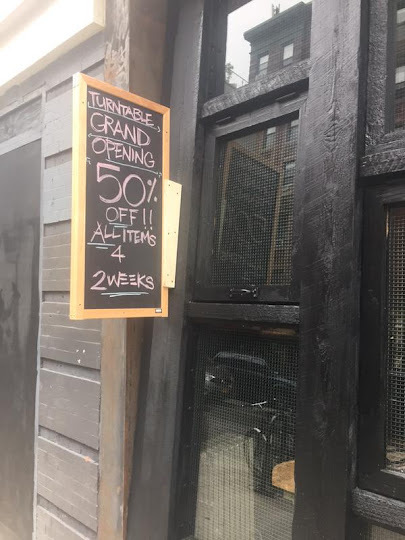 As the signs outside the Avenue B restaurant show, everything is apparently 50 percent off during their grand opening over the next two weeks. The previous tenant at this address, Vella Market, lasted just six months here, closing in October 2013. The 16-year-old vegetarian restaurant Kate's Joint closed here in April 2012. 50% off for two weeks sounds like a going-out-of-business sale. Yeah I am going to love getting a bunch of chicken for $10 but it will be a never go to option when its $20. been to the one at 32nd street, the chicken is fantastic. Ugh, this screams douche hole, but I hope I'm wrong. I saw flip flop bros outside of it commenting about it, excited about it. Say what you will but I was happy to see the owners and whoever was working on it are Asian. At least not some investment bros. At least there's some authenticity! I went here // not a douche bag bro with flip flops - just love this food. The service was so bad and the ventilation in this place is really bad. My clothing smelled so bad for days.